That's all from us for the evening then - ta-ra and I'll see you tomorrow night with all the action from the Hawthorns. “Our concentration levels were really good. We lost tight games to Man City and Spurs, which were kind of self inflicted, but not today. We concentrated really well, and the centre-backs were the pick of the bunch. "The wide guys made the breakthough, it was actually Wilfried Zaha a substitute that did that. I have three great options but only two can play. It was nice that Wilf got that reaction, we trust him. "The penalty was a very good decision, the ball was just outside the box but the challenge was inside. It was dispatched by Yohan Cabaye, though Dwight Gayle was meant to be taking it so it surprised me. "Cabaye’s got experience and confidence to do it at any level. He’s level and confident, Dwight has had his share of penalties, he had two this week, so it would have been a bit greedy." "We have good players to play away from home. In the first half we didn’t give any concessions to Watford, it made the game even and tight and not particularly entertaining, but gave us good confidence to win the game, and we did. "That’s the options when you’ve got quality players – more and more of these Premier League games are 14-man games and you need that strength and quality off the bench. I didn’t think we deserved to lose at Man City, Tottenham was tough on us too, so this makes up for those." Crystal Palace are at home to West Brom next weekend, while Watford travel to Bournemouth. Alan Pardew says that his side are set-up to play away from home - and the stats bear that out. Three away wins from four games this season. Watford manager Quique Flores tells BBC Sport: "There was not much difference between the two sides today. "It was difficult to stop their attack, it was uncomfortable for us. We need to open up the pitch more. Kyle Utterson: Not the best of games but massive win for Palace taking them 6th and I think they are genuinely top 6 contenders. Ben in Brighton on text: May be stuck on a Geology field trip in Dorset but great to see Palace win again!! Yohan Cabaye is rewarded for a great start to his Palace career!! Shane Daly on Twitter: I think its safe to say that Alan Pardew is a top manager, I don't mean good, I mean he's a great manager, well done Alan. How good a manager is Alan Pardew? Where can Palace finish this season? Get involved using #bbcfootball on Twitter, post on the BBC Match of the Day Facebook page or text 81111 - just remember to include your name. Watford end the weekend in 13th spot but it's hard to draw many conclusions from that performance. They failed to test Wayne Hennessey in the Palace goal on many occasions but didn't look unduly troubled either. Kyle Utterson: Pardew is probably the best English born manager. Maybe Eddie Howe though he's a lot younger. Phil Bird: Remind me again why Newcastle wanted Pardew out? Get involved using#bbcfootball on Twitter, post on the BBC Match of the Day Facebook page or text 81111 - just remember to include your name. Crystal Palace defender Scott Dann: "We knew it would be tough today so we are delighted. We deserved more from our last two games. We had to grind it out and it was our first clean sheet of the season." “Palace have got to keep their players fit and if they add in January who knows where they could finish. Crystal Palace slide up to sixth place in the Premier League - is Europe a realistic aim for the Eagles this season? “We've seen two teams who are evenly matched, Crystal Palace looked to counter from the very start, while Watford looked to build but didn’t get Ighalo and Deeney involved enough. "They huffed and puffed – the best chance was when they hit the cross bar. The key for Palace was getting Nyom isolated with speedy wingers like Zaha, and that’s what led to the penalty." Watford's biggest home crowd in 15 years leave in disappointed mood as their side trudge off the field. 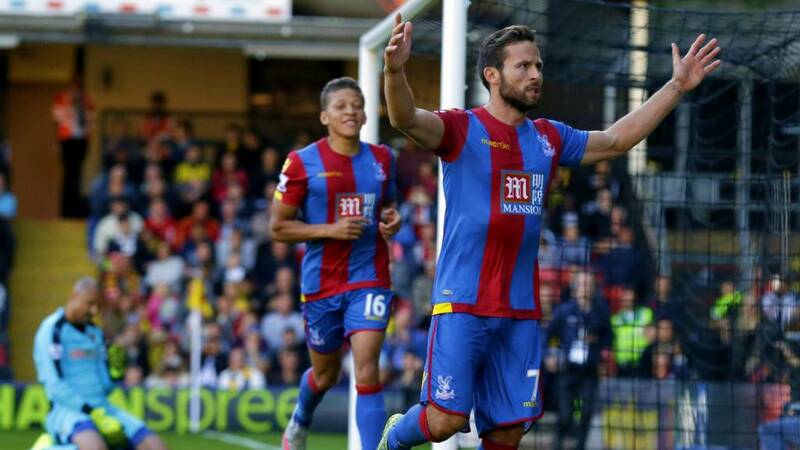 Match-winner Yohan Cabaye waits for a man in the Watford end and gives him his Palace shirt. Solid shift. Crystal Palace are sixth in the Premier League after yet another away win! Yannick Bolasie floats a shot from range onto the roof of the net. Watford just look frustrated as nothing they try comes off. Looks like a home defeat. Will we see #pardewforengland trending? It would make life more interesting on the international front I reckon. Into the final stages. Can Palace hang on? Is it going to be another away win for Palace? That's initially rubbish from Dwight Gayle as he runs into a cul-de-sac after beating the offside trap, it's then genius as he somehow extricates himself into space and powers in a left-footed drive that flashes a yard wide of the post. His reward is to be hooked. On comes Frazier Campbell. Yes, yeh, yeh. You should see the weather in Salford. Eight minutes left. The neutrals don't need any added time. Almost the game-sealer. A cross from the left is headed down by Wilfried Zaha and Dwight Gayle gets across his man to nudge a volley on goal - but he can only find the side-netting. Incredibly bad free-kick from Watford sub Steve Berghuis lets Palace off the hook. Palace withdraw the now booked Yohan Cabaye and on comes James McArthur. Will there be a siege from the home side? Matthew Bennett: Annoying goal to concede. It's the only way Palace can ever score against Watford though. Was it a penalty? Get in touch now using #bbcfootball on Twitter, post on the BBC Match of the Day Facebook page or text 81111 - just remember to include your name. BBC Sport's resident Watford guru tells me that Wilfried Zaha was the Palace player fouled by Marco Cassetti for the decisive penalty in the 2013 play-off final. Basically the same place too. Watford didn't learn their lesson. Yohan Cabaye is booked this time. Definitely. 'It's just like Wembley again' sing the away fans as Palace enjoy their lead. Just over 15 minutes left as Watford chuck on Nathan Ake. Allan Nyom is the man off. “To be fair it’s been coming. Nyom is reckless and he’s keen, but in the box that’s going to cause a problem. "Very, very cool penalty right in the top corner from Cabaye, Gomes is getting nowhere near that one - and I'm hoping that will get this game going." Watford instantly have a sight of goal but Idion Ighalo is blocked out. The Hornets have to push on now which may allow Palace more joy on the break. Where are you enjoying today's game? Get involved using #bbcfootball on Twitter, post on the BBC Match of the Day Facebook page or text 81111 - just remember to include your name. I thought Dwight Gayle would be on this butYohan Cabayepulls rank and then pulls out a fine finish, high into the net. Allan Nyom, that's on you. Something has happened! A silly, clumsy challenge from Allan Nyom on Wilfried Zaha. Right, right on the line. Penalty given! Where are you following the game from? Get in touch now using #bbcfootball on Twitter, post on the BBC Match of the Day Facebook page or text 81111 - just remember to include your name. Palace string together a neat move but it all unwinds via a slack touch from Yohan Cabaye. The longer it goes on, and the worse this game gets, the more depressing and annoying your pictures become. Not jealous Rob. At all. Watford make a change and it's Steven Berghuis on for Almen Abdi. I confess I don't know much about Berghuis. Let's see what he's all about. Where are you keeping in touch with the game from today? Bag of tricks off, bag of tricks on. Bakary Sako replaced by Wilfried Zaha for Crystal Palace. Can he find us a goal? And that's both sides who have hit the crossbar in this half! This is for once wonderful stuff down the left as Bakary Sako beats his man and puts over a fine low cross, in the corridor and Dwight Gayle stretches to reach it. He's never fully in control of the shot though and can only loop an effort against the outside of the post/bar. Bakary Sako scuffs a free-kick wide for Palace as both sides look desperately for a spark of imagination. The crowd have gone very quiet and you can't blame them. Corner for Watford whipped in, Sebastian Prodl has a free header but he somehow misreads the flight of it and the chance is gone. The Hornets turning the screw. Great strike! Watford come close again as Almen Abdi thumps in a shot from 20 yards which calls Wayne Hennessey into flying action. Lovely hit. Watford have Alessandro Diamanti available, or Palace could turn to the unpredictable talent of Wilf Zaha. You do not get much closer to scoring than that. What a hit by Jose Jurado. Crystal Palace have reacted well though, attacking with pace and threat down the left and winning a free-kick of their own. That's more like it! Wonderful strike from Watford midfielder Jose Jurado, as he shakes, rattles and rolls the crossbar with a 20-yard free-kick! Great strike, and Troy Deeney can't keep the rebound down. cngaiyaye: Letting my mind wonder with the excellent commentary on BBC service here in Blantyre, Malawi. Anthony Wilkey: On the stunning Ilha de Tavira beach in the Algarve willing Ighalo to keep his good run going. Edward Hamilton: Tuning in from Biarritz to listen to the Eagles. Going for 2-1 to Palace, Gayle to score! COYP! Where are you watching or listening to today's game? Get in touch now using #bbcfootball on Twitter, post on the BBC Match of the Day Facebook page or text 81111 - just remember to include your name. Goalmouth action at last as some youngsters have a penalty shootout out on the pitch. A classic in the half-time entertainment world. Mildly better than a man trying to chip the ball into a shed, or zorbing, not quite as good as a falconry display I witnessed at Notts County on Boxing Day 1998. Not a lot of goalmouth action so far - what have you made of it? Neil Leverett: Watford yet to concede a goal at vicarage Road in their return to the prem in 315 mins. Disciplined. The Sweeper Keeper: The ball seems to have spent a great deal of time out of play. I've quite literally never agreed with Aidy Boothroyd more. We haven't seen anywhere near enough goalmouth action. Pards, Quique - have a word please. "Crystal Palace in particular will be saying let's get down the left and get at Allan Nyom more, encourage more width. Watford remain the only team not to concede a first-half goal in the Premier League this season. Can either side craft a goal after the break? "There's been two really good chances, for Watford a cross from the left and for Palace a terrific free-kick Hangeland's got his head to and Gomes made the save. I think at half-time that's a fair result and the referee has done very well." Here we go then, this is it! Odion Ighalo is fouled by Brede Hangeland, 25 yards out. Bang central. Curl this in...? Decent effort from Ikechi Anya but it hits the top of the wall and flicks away. Crystal Palace are pumping in the crosses - they've delivered 11 from open play so far. That's more than Arsenal (8), Liverpool (10) and Tottenham (9) managed in 90 minutes yesterday. And those three scored 12 goals between them. Ikechi Anya gets on his bike to attack down the Watford left but Brede Hangeland is able to extend a go-go-gadget leg and hook his cross away from the waiting Troy Deeney. Are we going to get a goal before half-time? Doesn't look like it. I can't help but feel that you're not making the most of Florida Steve. Yohan Cabaye's free-kick zips through the goalmouth. Aham Ebogu: Rooting for Ighalo to get the goals all the way from Lagos Nigeria. Steve Smith: Listening to Radio 5 Live, from Port St Lucie, South Florida - come on, you 'orns!! Where are you following the game today? Get involved using #bbcfootball on Twitter. Yannick Bolasie into space, his cross is easily cut out. I hesitate to use the word 'poor' but this game is not really kicking into gear. It transpires that Yohan Cabaye WAS NOT BOOKED for that challenge a few moments ago. My apologies. Palace now win a corner, can they fashion a chance? No. Over hit and out of play. Troy Deeney does well to beat Scott Dann to a cross from the right but he can't generate the required power or accuracy on the header. The fans have mirrored the action on the pitch now, going a bit quiet. Yohan Cabaye is in the book for a clumsy challenge in midfield, the game is in a lull. My late dog Sox who died aged 16 two years ago was called 'Wembley Whitesox Ravanelli Mcfarlane.' Born in 1997 and named after Boro's first goalscorer at Wembley vs Leicester in the League Cup final. This May at the play-off final Sox finally made it to Wembley. His ashes were left to flutter around the great stadium. Shame about the result. Watford having more of the ball now but it's Palace who carry all the threat in the final third. Troy Deeney and Odion Ighalo not in the game for Watford yet. Do you reckon Crystal Palace are trying to get at Watford down the right? This graphic certainly suggests so. Yohan Cabaye lines up another free-kick for the dominant Palace, it hits the wall though and Jason Puncheon screws the follow-up wide. Is Puncheon in with a chance of an England call-up at all? Roy Hodgson could use his remaining qualifiers to give some fringe players a go. He won't. But he could do. Ben Watson hurt his wrist in the penalty area during that Brede Hangeland chance but after some treatment he's OK to continue. The early break-neck, break-wrist tempo is threatening to die down. Troy Deeney is dropping deep to try and link up with Odion Ighalo but his low cross is easily cut out. Palace counter and win a free-kick. What a delivery! Yohan Cabaye with a sensational cross, Brede Hangeland meets it with a meaty forehead and Heurelho Gomes makes a point-blank stop. Let us know if you are tuning in from foreign fields. I make it around 20 nationalities across the team sheet today. A global game for sure. Palace continue to keep hold of the ball - they've had a touch under 80% of the possession so far. It's still a game being played on steroids, no time to take a touch in midfield. Our texter's rather fanciful claim earlier on that this is also the two best sets of fans in the Premier League may not be far off the mark - plenty of noise in the opening stages. Quote Message: It’s a very good start from Watford and it’s vital today they defend well and don’t give up the ball and allow Crystal Palace to set off on those lightning counter attacks. It’s a very good start from Watford and it’s vital today they defend well and don’t give up the ball and allow Crystal Palace to set off on those lightning counter attacks. Watford's record signing 'Saint' Etienne Capoue launches a shot wide from 25 yards. It's shoot on sight stuff in the early days here. I'm all for that. If the game carries on at this pace we'll need oxygen in the press box, never mind on the field. Watford attack this time, Craig Cathcart's cross not dealt with and Troy Deeney almost getting in behind the Palace defence. 100mph stuff. A console game start from Palace, they pass it to Yannick Bolasie from kick-off and he runs straight at goal, shooting over from 20 yards! That's the way to do it. Electric. Game on at Watford. Lovely afternoon for it. Gregory Edwards: My dad's last game before he died was Swansea Reading 2011 play-off final.A memory I'll cherish forever. My dad with his two boys. Watford: Gomes, Nyom, Prodl, Cathcart, Anya, Abdi, Capoue, Watson, Jurado, Deeney, Ighalo. Subs: Paredes, Ake, Guedioura, Ibarbo, Berghuis, Diamanti, Arlauskis. Crystal Palace: Hennessey, Kelly, Dann, Hangeland, Souare, Cabaye, Ledley, Sako, Puncheon, Bolasie, Gayle. Subs: Mariappa, Campbell, Zaha, Alex McCarthy, McArthur, Gray, Croll. Watford have won just one of their eight Premier League matches played on a Sunday (W1 D2 L5), but are unbeaten in their last three. This is the first top-flight meeting of these two sides. Sun's out, fans in good voice, Harry the Hornet is buzzing. Let's do this! Steven Levett: Sadly still not seen a game at Wembley, but I saw Ed Sheeran perform and he wore an England shirt if that counts! Dave Sey: seeing Northampton get taken apart in 20 odd minutes against Bradford in the play off final 2013. Nathan Spafford: THAT Alex Revell goal, followed by THAT Steve Evans celebration. A picture can't do it justice Nathan. Keep your Wembley memories coming - post on the BBC Match of the Day Facebook page now, you can also get in touch using #bbcfootball on Twitter, or text 81111. Crystal Palace boss Alan Pardew: "Dwight Gayle comes in and he will take shots. Lots of shots. "It's an attacking set-up away from home. We won't be gung-ho but it's important to find the right balance. "Watford have been doing really well but we come here to knock them off their perch." Almost game time at the Vic then. It's very rare that there is only one game on a Sunday - everyone is watching lads. Time to deliver! Alex in London on 81111: Manchester City come from 2-0 down to win on penalties against Gillingham in the 1999 play off final. I was 8 years old and my uncle didn't want to leave early like the rest of the fans who'd given up hope. Luke Nerac: My brother crashing my car the day before, then travelling from Jersey to see Spurs lose 5-1 to Chelsea in FA Cup Semi. Tell us your Wembley memories good and bad on the BBC Match of the Day Facebook page now, you can also get in touch using #bbcfootball on Twitter, or text 81111. Barry Lee Duxbury: 10th time lucky for Preston in the play offs, only bettered by six weeks later watching AC/DC there. Amazing memories at that place! AC/DC can't compete with PNE surely? Steve Hamilton: Arsenal v Ipswich 1978 and v West Ham 1980 - lost both. Brilliant time in 1979, beating Man Utd 3-2. You can still give us your Wembley memories on the BBC Match of the Day Facebook page or use#bbcfootball on Twitter. Whatever we decide on, I feel Phil Brown comes out of that very well. Twenty-five minutes to go until kick-off at Vicarage Road. Who does Quique Flores look like? Kush in London: Re:15:14 That's obvious, he looks like a cross between Southend manager Phil Brown and actor Hugh Laurie! ...a touch of Phil Brown?Image caption: ...a touch of Phil Brown? ...a smidge of Ben Stiller?Image caption: ...a smidge of Ben Stiller? But Al Pacino?! No chance.Image caption: But Al Pacino?! No chance. Jimmy Frigg: Scunthorpe fan lost 3-2 to Luton in the Johstone Paint Trophy in April 2009 but returned seven weeks later to beat Millwall 3-2 in league one play off final. Mick Munday: 1972 League Cup final Stoke beating Chelsea 2-1, and Bruce Springsteen in concert 1985. Back in the Premier League, Odion Ighalo has scored four of Watford's five league goals this season, earning the Hornets six points. Could he prove to be one of the surprise hits of the season? Tom Cross on Facebook: Portsmouth beating Spurs in the 2010 semi-final. Massive underdogs, relegated the day before and still overcame the odds to beat them. So many sub plots as well. Amazing day. Dave Bewes: Bradford being outclassed 5-0 by Swansea in the League Cup final, then 3 months later dominating Northampton to win promotion. Stuart Clark: Being a Swindon fan, the old Wembley was superb, played 3 won 3. 1 league cup final, 2 play off finals. Not so good at the new Wembley, played 3 lost 3. You win some, you lose some. What are your Wembley memories good and bad? Get in touch now using #bbcfootball on Twitter, post on the BBC Match of the Day Facebook page or text 81111 - just remember to include your name. Our colleagues on the BBC Sport rugby desk compiled this handy guide to the best beards of the World Cup this weekend - but Joe Ledley would more than hold his own. The Welshman starts in midfield for Palace this afternoon. Darren Winsper: My first away game was going to watch West Brom was against Portsmouth in the FA Cup Semi Final. We lost but it was a hell of an experience! Alex Cook: Witnessing Palace beat Watford in 2013. After Kevin Phillips scored the penalty, I spent the majority of extra time staring at the scoreboard and wishing for the game to end! Kiel Kyle Jennings: Kidderminster Harriers. First team to take the lead in a competitive game at the new Wembley. First team to lose a competitive match at the new Wembley. Mixed feelings. What are your Wembley memories? Get in touch now using #bbcfootball on Twitter, post on the BBC Match of the Day Facebook page or text 81111 - just remember to include your name. Watford manager Quique Flores - who I've still not quite decided who he looks like - is in bullish mood as he faces the TV cameras. He says that Palace will come at them with pace on the counter attack but his side will aim to control possession. I covered that game Steve! A great moment for sure - unless you support Bristol City of course. Being a neutral at a play-off final can be a wonderful thing. Loving your Wembley memories so far - keep them rolling. Steve Houlton: Championship Play off final 2008. Windass goal and first promotion to the top flight. Great day. Luke Woodward: FA Cup semi-final Stoke beating Bolton 5-0 was amazing. Also the Auto Windscreen Shield final Stoke 2-1 Bristol City in 2000. Matthew Hague: Kayode Odejayi missing a one-on-one to keep us in the Barnsley vs Cardiff FA up semi. Can you better that? Get in touch now using #bbcfootball on Twitter, post on the BBC Match of the Day Facebook page or text 81111 - just remember to include your name. Middlesbrough stay second in the Championship after a convincing win. Who said 4-4-2 was dead? Alright, everyone did. But Watford keep the faith. There's goals in this team - but will Ikechi Anya be OK at full-back against the rapid Palace counter? What are your best and worst Wembley memories? Ollie Binns: Hull going 2-0 up inside 8 minutes in the FA Cup final. You can get in touch now using #bbcfootball on Twitter, post on the BBC Match of the Day Facebook page or text 81111 - just remember to include your name. The Watford team news is as simple as it gets - they are unchanged from the team which won at Newcastle last time out. Wembley is a place for winners they say, but someone has to lose. What are your memories good and bad? Myles on Twitter: Cardiff fan, lost the FA cup final, lost the play off final 3-2, and the carling cup final to Liverpool. Solid record? What are your Wembley memories - get in touch now using #bbcfootball on Twitter, post on the BBC Sport Faceboook page or text 81111 - just remember to include your name. Palace make six changes from the team which beat Charlton 4-1 in the League Cup in midweek. Plenty of pace going forwards in this team, and Wilfried Zaha on the bench too. The breaking Palace team news is that Dwight Gayle keeps his place in attack after scoring a midweek cup hat-trick. Wayne Hennessey also starts in goal. Think you can out predict Lawro?Now's your chance. Play our predictor game now! You have to laugh. Or cry. Incredible error from Sol Bamba allows Boro to add a late third. What are your memories of Wembley - good and bad? Did you team triumph or did you get stuck on the tube and miss kick-off? Andrew Roach: Without doubt the lowest point of 30 years of supporting Oldham...THAT Mark Hughes goal at Wembley to equalise. Jack Tanner: Hate the new Wembley. been there three times with Swindon - lost all three games, seven goals conceded, none scored. You can get in touch now using #bbcfootball on Twitter, post on the BBC Sport Faceboook page or text 81111 - just remember to include your name. Crystal Palace manager Alan Pardew: "We've got a lot of pace in the team, which makes us dangerous away from home. Out of adversity and all that Nick? You've sold me on a cracking atmosphere now. Let's raise the roof! Watford head coach Quique Sanchez Flores: "We feel confident but we must respect Crystal Palace. They have achieved very good results away from home. In Sunday's early game high-flying Boro are 2-0 up at home to Leeds with 20 minuets to go. There has been some chronically bad defending, and you can follow the final knockings here. "The last time these sides met was at Wembley. It's taken Watford a little longer than Palace to make the step up, but now they're both looking comfortable in the top flight. "All eyes will be on Odion Ighalo, whose footballing journey has taken in Nigeria, Norway, Italy and Spain before landing at Watford. The 20 league goals he's scored in 2015 are certainly catching the eye. "Palace's aggressive attacking approach is invigorating. It's a desire to win which can sometimes end in defeat - but seldom draws. In 29 games in charge, Alan Pardew has only shared the spoils once." You can enjoy live radio commentary from Vicarage Road this afternoon via the medium of BBC Radio 5 live Sports Extra. Tune in online, on your radio or on this here page. Watford are looking for revenge this afternoon after heartache at Wembley in the play-off final two years ago. The old/new stadium has been a theatre of pain for many, a crucible of war for some, an island of joy for plenty. You must have some Wembley stories. Let's hear them. Good or bad. Your finest hour? Your lowest low? Travel problems? Maybe you found love on the Metropolitan line? Get in touch at #bbcfootball, pop on to the BBC Sport Facebook page or BBC Sport's Google+ area. You can also text us on 81111 in the UK only - don't forget to say who you are and where you are texting from. Have you seen a Cup final win at the stadium?Image caption: Have you seen a Cup final win at the stadium? Maybe even travelled from abroad?Image caption: Maybe even travelled from abroad? Football in 1987.Image caption: Football in 1987. It is over 28 years since Watford won three straight games in the top flight. A record they can match this afternoon. April 1987 saw the Hornets - at the back end of Graham Taylor's magnificent first spell at the club - win four games in a row. Madonna's 'La Isla Bonita' was number one, an income tax rate of 25p was mooted by chancellor Nigel Lawson and the world had its first sighting of The Simpsons. Kevin Phillips' penalty in extra-time was enough for Crystal Palace to beat Watford at Wembley and book a place in the Premier League. Losing at Wembley is brutal. Losing in extra-time, even more so. Seeing Palace go on to stay up, recruit the likes of Yohan Cabaye and flourish under the stewardship of Alan Pardew, even more so again. But Watford didn't have to wait long to join the Eagles in the top flight. Today the sides meet for the first time since that sunny day down old Wembley way - with the Golden Boys chasing a slice of club history. Cue up 'Z Cars', get the Sir Elton John stand rocking. It's the only game on this weird Sunday so let's crank it!